Until recently, loungewear was considered an after thought. Something you wore in the comfort of your home (mainly consisting of less than tailored sweats or, quite possibly, nothing at all), free of the judgmental eye of the outside world. But, as of late, there has been a noticeable shift of attention to detail in regards to such garments. Garance first met Licheng on a trip to Shanghai, and since then we have come to adore her brand, Homeism’s, thoughtful approach to loungewear. Take this robe – loose fitting and eloquently complemented by shawl collars, patch pockets, and delicate piping. Every detail is constructed with such care and respect to the design’s traditional oriental roots. It is impossible not to acknowledge and feel encouraged to keep the style standards I set for myself outside of the home, within it too. Who says I can’t attain the effortless beauty and comfort of modern femininity, inside and out? 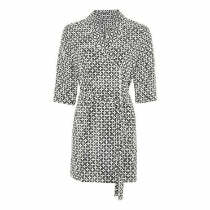 Not to mention, a robe this good makes for a chic overcoat on those chilly Spring days! I work from home and although I dress most days , there are those days when a pair of silk p.j.’s call your name.I also have days when sweats are calling.. Its all about understanding your options and respecting yourself! If only we all looked as great rocking a robe! I am a MAJOR lover of robe life. I have one silk/polyster blend robe that my aunt bought for me in Chinatown in San Francisco 12 years ago and has really grown up with me. It has beautiful embroidery on the back, and she has always embodied an elegant role model for me. I have another red silk robe that I personally purchased in Chinatown in San Francisco about five years ago and I think I could keep collecting infinitely! I have a silk robe – you have inspired me to get it out! Yes! I’ve bought robes from Bangkok to Little Palm Island, never wearing them as they were intended, but as overcoats because I found them too pretty to keep inside. And very chic.